We work to protect the rights of Dorset residents and visitors to have timely access to Emergency and Maternity services, and to NHS beds, when they need these. We heard yesterday that we have been granted a hearing at the Court of Appeal! A patient, supported by Defend Dorset NHS, and represented by Leigh Day Solicitors, is seeking Judicial Review of Dorset Clinical Commissioning Group's (CCG) plans to downgrade Poole A&E, close Poole Maternity, close Acute Hospital Beds, and close Community Hospital beds in 5 of 13 Dorset locations. We need your support to bring a legal challenge! The plans leave tens of thousands of Dorset residents without access to A&E and Maternity services within the 'golden hour', and will lead to the lives of many patients being unnecessarily put at risk. Dorset County Maternity & Paediatrics were also at risk. The CCG said recently that they AIM to maintain these, but this is not guaranteed. If Dorset County Maternity is closed, Dorset will have lost 2/3 of its Maternity services, leaving only one Maternity remaining, in the far East of the County. Dorset is forecast to need 2467 acute beds, and we have just 1810. Yet the CCG's plan is to REDUCE existing acute beds to 1632, only 2/3 of what we are forecast to need. Emergency and Maternity services cannot operate if there are no beds available. Community Hospital beds for rehabilitation, palliative care, or dementia support, will also be lost at Ferndown, Wareham, Portland, Alderney and Westhaven Community Hospitals. Around the UK there is little evidence to suggest that 'replacement services' in the community have reduced demand for beds to 2/3 of forecast need. We do not know what the Dorset replacement services will be, or how they will be funded, or staffed. The Judicial Review addresses the issues of: i) closure of beds before staffed replacement services are in place; ii) unsafe travel times to access A&E and Maternity services and iii) that aspects of the 'consultation' carried out on these changes were so misleading as to render the consultation unlawful. Dorset is at the forefront of cuts which are planned across the NHS in England. A successful challenge here is likely to have repercussions for cuts in other areas. Local people raised the initial funds for Counsel's opinion. We are now fundraising towards the next stage, Merits Hearing. We then hope that, at Merits Hearing, a Full Hearing will be granted. We will then have a Stage 2 fundraiser towards those costs. Please support our campaign! Stand with us against these dangerous and ill thought out cuts to our NHS. We must save this unit for Poole. I'm delighted to say that we have now raised the additional community contribution for the costs of the Claimant's legal submission seeking leave to Appeal. We are waiting to hear from the Court of Appeal as to whether leave to Appeal has been granted. This can take some months. The lawyers for the Claimant, Leigh Day, have requested that the Court of Appeal's decision is expedited. Dorset Clinical Commissioning Group have stated publicly that they continue to implement the changes, despite the ongoing judicial process. There is also ongoing local authority challenge through Health Scrutiny: Dorset County Council referred the plans after a year of lobbying in November. 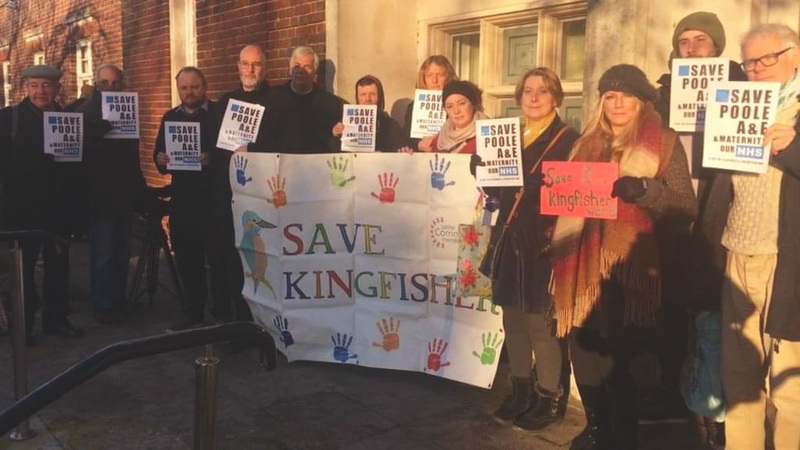 Poole Borough Council committed to write in support of Dorset County Council's referral in December, after 18 months of inaction and following intense lobbying. We will keep you updated regarding any further developments. Thanks again for helping us stand up for our lives, and for our Dorset NHS Hospitals, Departments and Beds. Thank you for your interest in saving Poole A&E and Maternity and Dorset NHS beds. Our Legal Team at Leigh Day have filed an excellent Appeal application and we need to raise our final £5,000. The good news is that, due to some late donations for our last stage of fundraising, and some pledges we have received, we hope we will only need to raise another £3,000 through CrowdJustice. Can you help by donating or sharing the link to this page by email or on social media? Leigh Day will be asking the Court of Appeal if we can have a decision on whether we can Appeal or not as soon as possible, and I will post another update as soon as we hear. Following the shock outcome of our Judicial Review Hearing, and our legal team at Leigh Day advising that we have good grounds for Appeal, an Application for permission to Appeal was filed at the Court of Appeal, on 27th September. We will now wait to hear from the Court of Appeal. Should permission to Appeal be granted, we will need to raise a further £5,000 for the Appeal Hearing, and we will re-open the CrowdJustice page for donations. We hope that you will support our cause again to Save Poole A&E and Maternity and Dorset NHS beds if we are able to secure an Appeal Hearing. We will update this page when we hear. We were very shocked to hear today that our case was not upheld at Judicial Review. We were at the Hearing and we repeatedly witnessed the CCG being unable to respond to the genuine concerns that we raised. This Judgement does nothing to address the clinical risk to Dorset residents of having to travel further in an emergency. The CCG calculated from the Ambulance Trust Report, which was about actual Dorset patients attending Poole A&E and Maternity by ambulance last year, that over 4 months 132 were at potential risk of harm from longer journey time, this is 396 Dorset residents over a year. A Dorset A&E Dr said almost half of the cases in the Report were in imminent danger of dying if they had to travel for longer to access help. We calculate 180 people per year going to Poole A&E by ambulance are at risk of dying as a result of these changes. This does not include the risk to mothers-to-be and children as most are excluded from these figures as they do not get to A&E by ambulance. There were almost 600 maternity emergencies treated at Poole last year and 250 newborns needed neo natal intensive or high dependency care, which is no longer available at Dorset County. We have 21 days to consider whether we wish to seek leave to Appeal. We will be speaking to our QC on Friday. We also need to consider the health of the Claimant, which is significantly worse than it was when we started this process last Autumn. If we decide to seek leave to Appeal we will post any news on the page and will re-open the page for fundraising if we are granted leave to Appeal. We had our Hearing this week, on Tuesday and Wednesday. People concerned about our NHS in London, including some of those involved in the Save Lewisham A&E and Maternity campaign 5 years ago, and Eleanor Smith the MP who has tabled the NHS Reinstatement Bill, came to stand with us outside the Royal Courts of Justice on Tuesday morning. Our QC was Jason Coppel, through Solicitors Leigh Day. Jason is an experienced QC with an impressive record, and he went about quietly and meticulously demonstrating that the CCG Board was not given the information it needed to make the decisions it made on 20th September 2017. It is clear that information that there was potential clinical risk to almost 400 people per year as a result of loss of A&E and Maternity at Poole was not properly reported to the CCG Board. In fact it had been erroneously claimed in the Consultation document and was claimed again in the Decision Making Business Case that the changes would 'save 60 lives'. The 'further review by a range of Clinicians' of a sample of the cases of potential risk identified, called for by the Ambulance Trust Report, had not been completed by the time the decisions were made, or since. It was also apparent that how the replacement integrated services expected to reduce demand for beds would be funded and staffed was unclear. The NHS staff side reveled a large challenge in terms of filling existing Community vacancies and new posts - around 900 staff would be needed in all, against a back drop of Dorset Clinical Commissioning group's promise to 'save' £229 million per year. No audit of social care staff needed for the 'Integrated Community Teams', had been carried out. There was humour at times, including when the Barrister for the CCG attempted to convince a nonplussed Judge that 'people need treatments, not beds'. 'Is there not some relation between the two?' he asked. We are quietly confident about the JR. We expect the Judgement in early September. Judicial Review Hearing this week! Well the week has finally arrived and our case is due to be heard this Tuesday 17th and Wednesday 18th July at the Royal Courts of Justice on the Strand, London WC2A 2LL. On Tuesday 17th July, before the case starts, we will be holding a peaceful demonstration outside the Court from 9.30am. We are very fortunate in that Eleanor Smith MP, who tabled the NHS Reinstatement Bill last week, will be standing with us. The local BBC Solent will also be covering the case. We would welcome your support if you are able to join us at the demonstration, or if you have friends and family in London who may want to stand up with us for Poole A&E and Maternity and Dorset NHS beds. People can then come into the Court for the case if they wish to do so. We trust that Justice will be served and that the Judge will agree that due process has not been followed in making these plans that put hundreds of lives at risk, will push remaining A&E and Maternity services far over capacity, and will remove much needed Community and acute Hospital beds, affecting access to care and rehabilitation. We do not expect to get the outcome next week. When we do have the outcome we will post it on this page. We're delighted that we have reached our funding total. We have submitted detailed case information and witness statements through our legal team at Leigh Day. Our Barristers will be making our skeleton argument over the next few weeks, which they will present at the Hearing, and within which they will refer to the evidence previously submitted. The Hearing is on 17th and 18th July at the Royal Courts of Justice, on the Strand, London WC2A 2LL. If you can join us on the 17th July at 9.45am outside the Court for a demonstration, that would be fantastic. The case is expected to start at 10.30am and the public can come into the Court. The case is expected to run 10.30am - 4.30pm on each day. If you would like to contact me to arrange to meet up at the Hearing, please email debmonkh@aol.com and I will reply. We've got our Full Hearing dates: 17 & 18 July! So now we have the deadline that we need to raise the funds by. Please continue to support our case to Save Poole A&E and Maternity and Dorset NHS beds by donating and sharing this CrowdJustice page. 23 June Swanage Quakers: What has the NHS meant to you? We're delighted to tell you that a Judge has considered our case and we have been granted a Full Hearing! This means we have to raise a further £10,000. We have some pledges to our Defend Dorset NHS account. The balance we expect to need to raise through CrowdJustice is £7,000. We will ask CrowdJustice to open the page for donations again. Please continue to support our case to Save Poole A&E and Maternity and Dorset NHS beds by donating via the page. Thank you so much everybody - there's been an amazing donation surge this afternoon. Once we get to £3,500, with some donations that were paid direct to Defend Dorset NHS, we've raised the funds for this stage, to Merits Hearing. We haven't got a date for the Merits Hearing yet, and won't know till then if we'll be granted a Full Hearing. So save your donations for the time being - if we get a Full Hearing we will have to raise another £10,000!